Four decades after his first appearance in Amazing Fantasy #15, Columbia Pictures’ Spider-Man movie has honoured the original adolescent anti-hero with an undisclosed budget so high that, according to its director, “if you knew how much it was, it would give you a nosebleed”. Spider-Man once survived attack from an alien entity disguised as his own costume, but can this durable character emerge unscathed from Hollywood? In 1962, when the 40-year-old comic-book hack Stan Lee submitted his latest idea, his publisher, Martin Goodman, was not encouraging. The teenage orphan Peter Parker, having been bitten by a radioactive spider, might have spun webs, climbed walls and swung between skyscrapers, but he nearly never made it out of the notebook. “Goodman said I must have lost my marbles,” says Lee, reciting a well-rehearsed story he doesn’t sound the least bit tired of. “He said it wouldn’t work, for three reasons. One, he said people hated spiders, so nobody was going to buy a book called Spider- Man. Two, he said teenagers could only be sidekicks, not main characters. And three, he didn’t like the fact that Peter Parker had a lot of problems – money worries, girls didn’t like him, boys didn’t like him, family issues, allergies, asthma, ingrowing toenails. He said I didn’t understand what a hero was. He said heroes didn’t have problems, and that’s why they’re heroes.” Eventually, the first Spider-Man strip ran in the final issue of the failing Amazing Fantasy title, where it could do little harm. Lee got Steve Ditko to draw the character, thinking that his spindly style would suit the insect-human better than the robust approach of his usual artist, Jack Kirby, who had carved out the imposing figure of the Incredible Hulk. Favourable fan response swiftly made Spider-Man the flagship character of the fledgling Marvel Comics Group. Lee’s tale of the creation of Spider-Man is imbued, in hindsight, with a delicious irony. It has grown with the telling, because he is a natural storyteller. But behind his modest exterior and luxuriant moustache, he’s also aware of the importance of maintaining the integrity of a myth, be it his own or that of the characters he sired. As the movie prepublicity reaches saturation point here, it’s easy to forget what a radical concept Spider-Man once was, and how he broke the mould of the medium that spawned him. the book as a supporting character. At the start of the 1960s, superheroes remained largely lantern-jawed patriots. But when Lee put a New York teenager, Peter Parker, in a spider suit, it was as if he sensed the social changes that were to define the decade. After Ditko’s departure in 1965, Lee and a variety of artists made the Spider-Man comics into a check list of groovy countercultural concerns. Parker’s future romantic lead, Mary Jane Watson, tried out as a go-go dancer; his first love, Gwen Stacy, railed against the chauvinism of his employer, the newspaper editor J.Jonah Jameson; and credible black characters filtered into the supporting cast, articulating civil rights rhetoric. 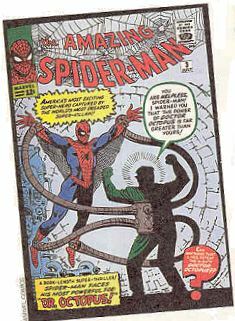 In June 1971, when Spider-Man saved his hallucinating roommate from the effects of an unspecified drug, Lee struck a blow against the McCarthy-era legacy of the Comics Code Authority. Amazing Spider-Man #97 was the first comic book since the 1950s to run without the cover bearing the authority’s official seal of approval. Traditionally, comics fans cower before the latest superhero blockbuster with a mixture of excitement and apprehension. But a forthcoming Daredevil movie starring the stoat-faced Ben Affleck aside, Lee’s creations seem to be in good hands. The Oscar-winner Ang Lee is overseeing an Incredible Hulk movie, and Spider-Man is not the disaster comic-book cross- overs nonnally are, even though it has its faults. Kirsten Dunst’s Mary Jane Watson is reduced from a feisty heroine into a piece of screaming meat; the motivation of Spider-Man’s archenemy, the Green Goblin, is muddy, and his comically inexpressive mask ironically conceals the genuinely terrifying face of Willem Dafoe; there’s a gauche metaphor for New Yorkers’ solidarity after September 11 in the final reel; and the action sequences have the airless, computer-generated sheen of Tomb Raider video games. But Tobey Maguire is appropriately bewildered as Peter Parker, and the script doesn’t try to turn a lightweight story into something dark and meaningful. As “event” movies go, it’s far better than most. It broke box- office records in the United States, taking $114m in its opening weekend, and it suggests that a Spider-Man franchise, if handled with more care than Warner Bros’ Batman, might have a substantial shelf life. Much of the credit for the movie’s success must go to the director and polymath Sam Raimi. In his insistence that Peter Parker be played by Maguire, an oddball leading man who’s about as quirky as one might expect a major studio to allow. Raimi reveals an understanding of the character from his past as a childhood fan. “In Stan Lee and Steve Ditko’s creation,” Raimi explains diplomatically, “the beauty of it was always that Peter Parker was one of us. He’s not good-looking, he’s not popular, he’s picked on and he’s from a lower-middle-class family. As well as fan opposition, Raimi had to clear substantial changes with his executive producer at Marvel Comics, who was anxious about how alterations to the character would affect merchandising opportunities. These problems presumably weren’t present on Raimi’s art-house thriller A Simple Plan, which wasn’t expected to launch a raft of Billy Bob Thornton action figures at pocket-money prices. So, when I read so much displeasure with the choices, it’s disquieting.” Raimi is being unduly modest. He is a craftsman. Filming his first feature, 1982’s Evil Dead, on a budget of $385,000, he patented “the shaky-cam”, a camera mounted on a plank of wood to simulate the approach of supernatural entities. Twenty years later, it is still terrifying. So, just as the comic book characters might be smothered in a big budget, are Raimi’s talents hidebound by the film’s computer-generated world? Does he feel removed from the finished product? There’ll be no time for a purge between projects, though. Raimi has already signed on for the sequel and has bought shares in Marvel Comics, whose rather doubtful recent financial profile will have been stabilised somewhat by his own hard work on the Spider-Man movie. He says that when Lee saw a rough cut of Spider-Man, he cried. “I was afraid to ask why he cried. Was he so upset or was he moved by it?” laughs Raimi. “I want him to like it,” he adds, serious again.